Small cacti and other succulent plants can be grown in holes in tufa or limestone blocks. This mimics the situation often seen in their habitat, where well-developed cacti grow in small cracks and hollows in rock faces. 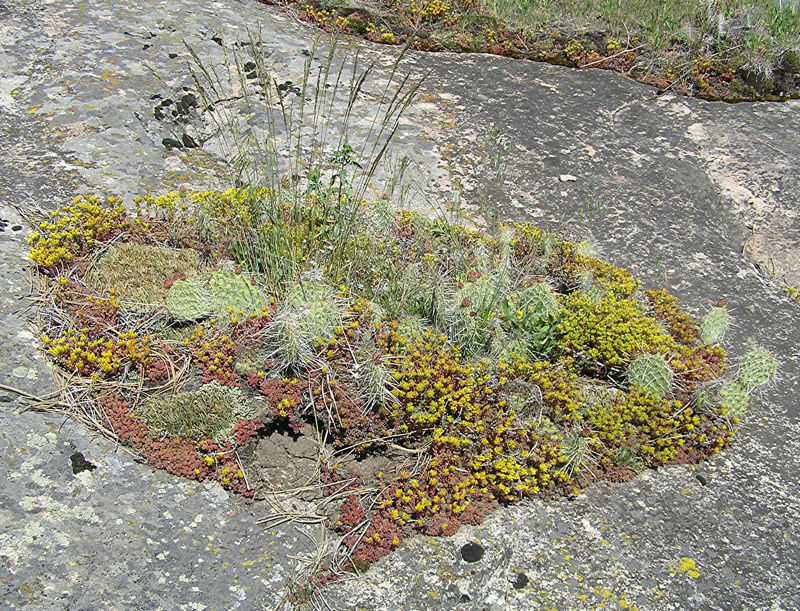 Choose small plants native to limestone areas, which may often be bought as seedlings. Many white-spined Escobarias and Mammillarias remain small when mature and are very suitable. Avoid lime-intolerant plants e.g. 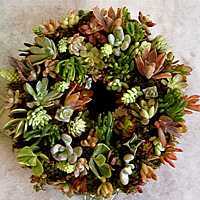 Echeverias, possibly Gymnocalyciums and cacti that grow large when mature. Carefully enlarge natural holes in the block of tufa with a masonry drill to provide sufficient root space. Wash peat-based compost from the roots. Insert the roots into holes in the tufa, filling around with loam mixed with 10% dolomite of lime. Small pieces of limestone may be used to cover the hole and wedge the plant in place. As there is less root space than in normal cultivation, the plants will need watering more often than is usual for pot-grown plants. 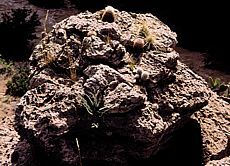 The block of tufa may be stood on the patio during the summer to catch the rain. Indoors, or during dry periods, a little water allowed to run over the limestone will find its way into the planting holes. Feed with low-nitrogen cactus fertiliser to maintain compact growth. and accompanied by a xerophytic fern and tufts of grass. 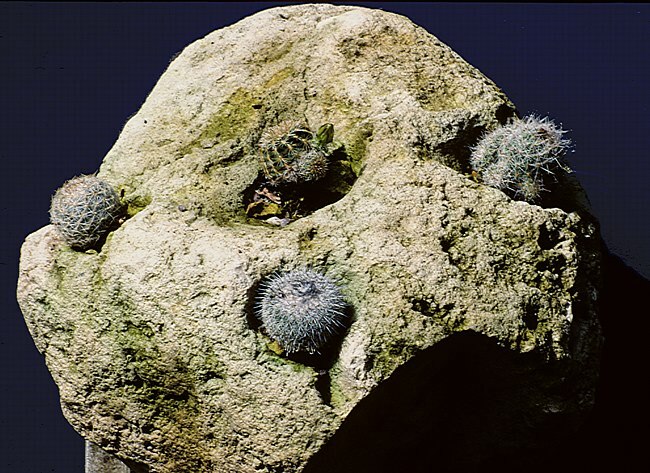 Small cacti and succulent plants are suitable for growing in rock gardens in warm climates. Many natural examples can be seen in their habitats that could be copied. 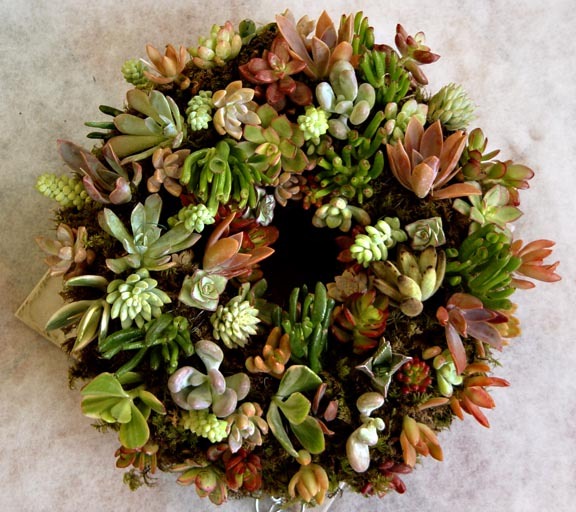 In a temperate climate, succulent plants and cacti can be bedded out for the Summer or cold-hardy varieties cna be chosen. 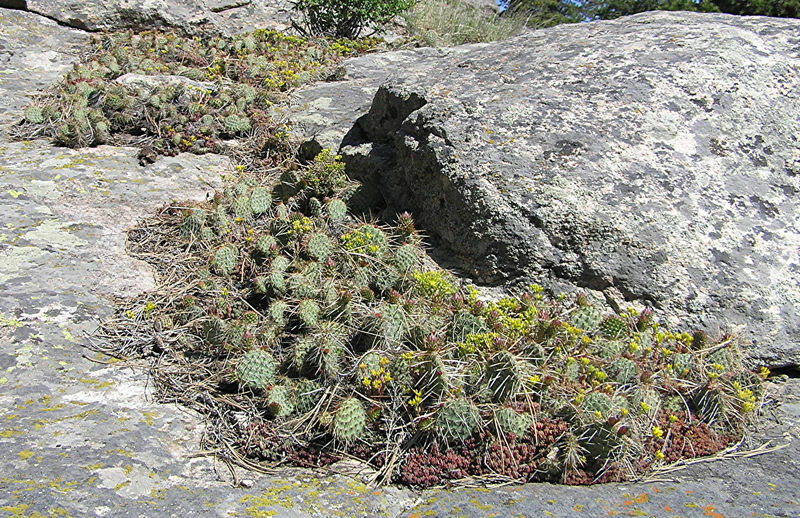 Left: Examples of natural rock gardens in shallow depressions on sloping rock faces in Colorado. 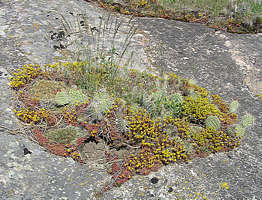 Plants include Sedum lanceolatum and Opuntia erinacea. 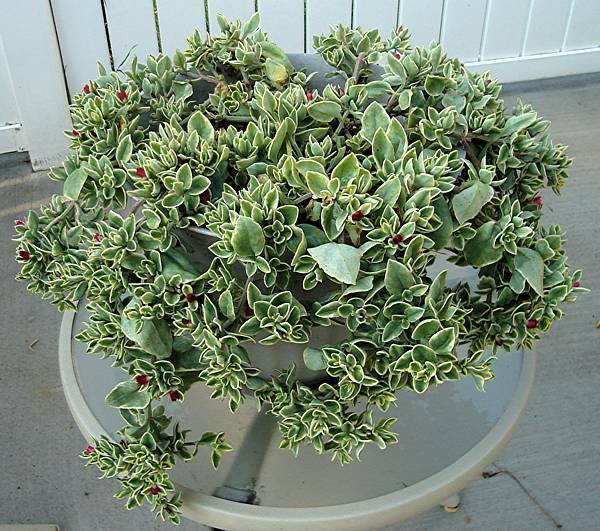 In a temperate climate, it is still possible to choose succulents that are cold-wet hardy. 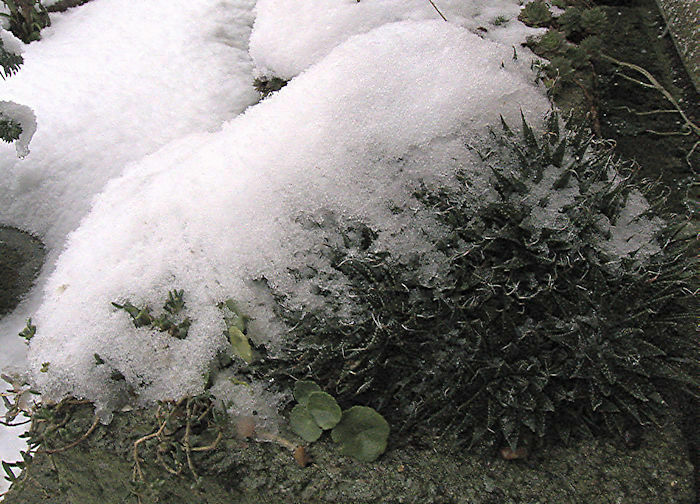 Many Sedums are very hardy outdoors. 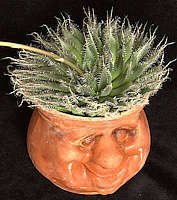 Crassula sarcocaulis is unusual within its genus for being really cold-wet hardy. 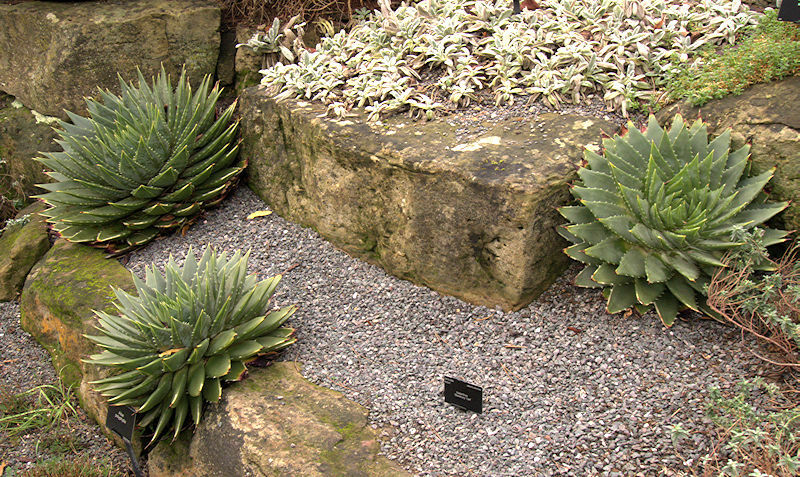 Upper left: Aloe polyphylla has survived two Winters in the rock garden at Royal Botanic Gardens, Kew. Lower left: Aloe aristata also seems to be hardy in South-East England and has been none the worse for a regular topping of snow during the Winter. 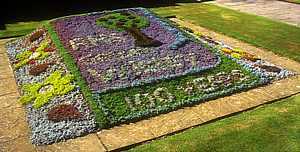 During the Summer, it flowers freely in its outdoor planter. Left: A hotel garden in Italy planted with many succulent plants including a splendid group of Yuccas, probably Y. rigida. 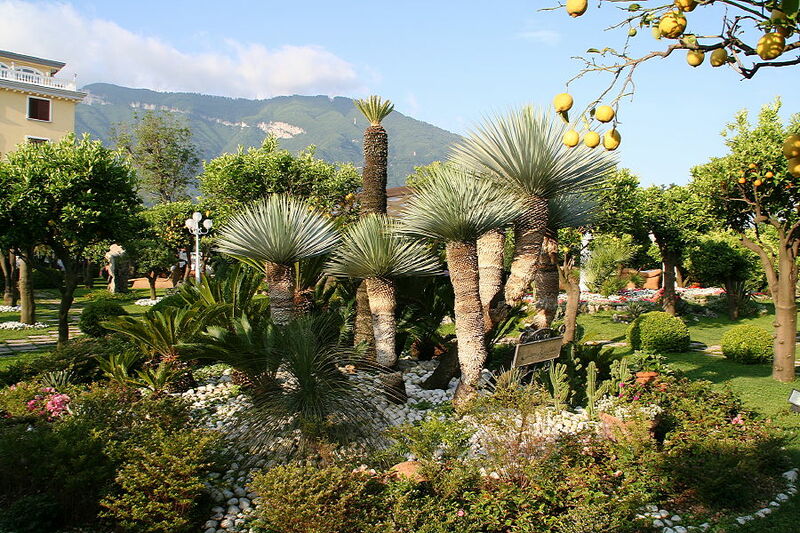 The planting also includes Cycads, Euphorbias and a Dasylirion. Grown & photographed by Thom Riddle, 2007. Left: Many trailing succulents and cacti are excellent subjects for a hanging basket. This one is planted with a varigated cultivar of the hardy Mesmb. Aptenia cordifolia. 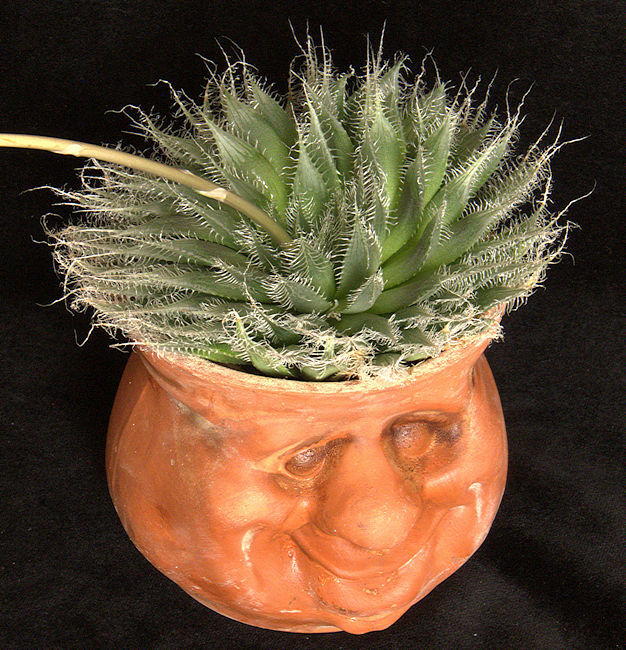 Other suitable plants include Aporocacti and other epiphytic cacti, trailing Senecios and Hoyas. 16869 Rio Maria Road, Lakeside near San Diego, Ca 92064. 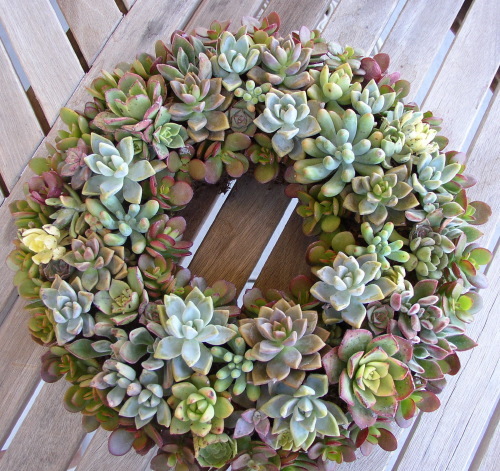 Follow the "Living Wreaths" link on their home page for tips on making these unusual decorations. 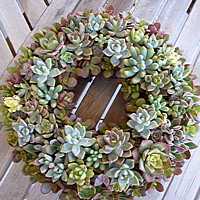 Succulent plants work well in a wreath as they need infrequent watering and can be kept alive by occasionally dunking the wreath in water. 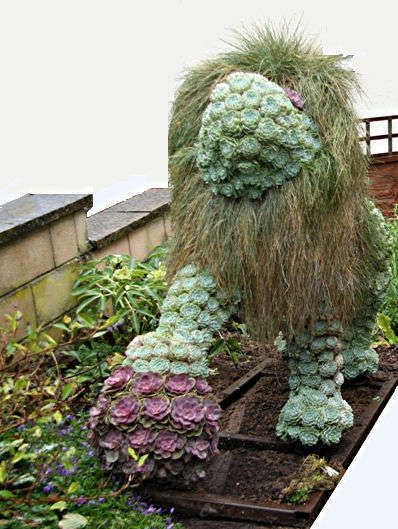 Left: A lion made with Echeverias and a grass mane. Planting is in soil supported by a wire frame to define the shape.